2019 Corvette ZR1 Launch! Sounds Awesome! - Muscle Cars Zone! 2019 Corvette ZR1 Launch! Sounds Awesome! It seems that it is a regular occurrence, but whenever we hear about a brand new car that is supposed to launch any time soon, we get extremely hyped about it and we all want to know as much as we can, as soon as we can. However, only few cars have managed to keep us entertained and interested in such as the one and only 2019 Corvette ZR1. Ever since its first initial plans about how the car is supposed to look like, everyone fell in love with it. There are also has been some leaked footage of this car previously. It sounds absolutely shocking, but this car costs $120,000 and you get 750 HP beast of a car that can get from 0 to 60 in fewer than 3 seconds. 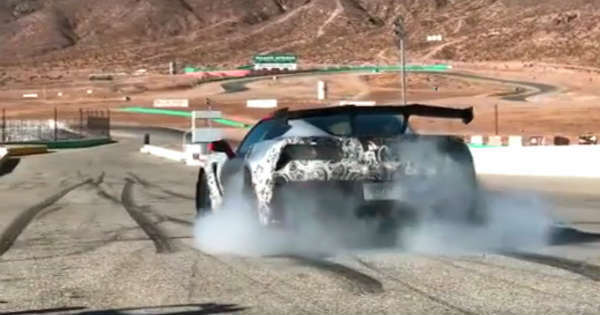 Hereby, in this video we take a short sneak peak of the 2019 Corvette ZR1 in action and it looks absolutely furious and mind-blowing. The paint job as well, is somewhat amazing and depending on your style, you are going to either hate it or love it. We hear the mighty engine roaring and reving up, hence the car is warming up for the real deal. Then, all of a sudden the Corvette ZR1 is seen launching its way up the runway, thus leaving behind huge clouds of smoke from its tires. Even though the video is very short, we still get the chance to see some part of the action. What do you think about this amazing super car?